Mamo Hawai‘i Patrick Branco, a member of the U.S. Diplomatic Corps who is currently stationed in Bogota, Colombia, came home for the holidays and attended today’s ceremonies at Mauna‘ala for the birthday of Queen Kapi‘olani and Princess Wahī‘ika‘ahu‘ula. 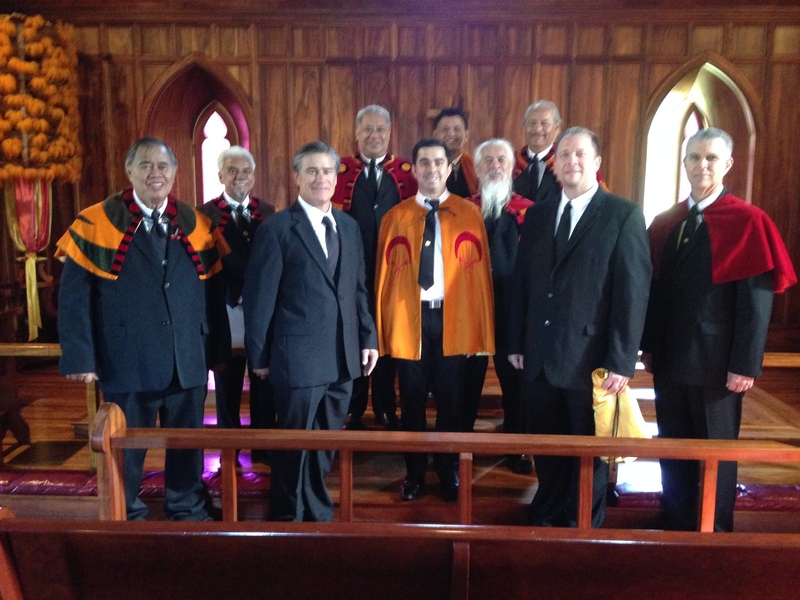 While there, Ali‘i ‘Aimoku ‘o Hawai‘i Sir Arthur Aiu took the opportunity to confer the elevation to Ali‘i 6th Degree on Branco which was approved at the last ‘Aha ‘Ula in October. Also in attendance today were Prince Ali‘i Sir Quentin Kawānanākoa and Ali‘i Hailama Farden. Ali‘i Farden was a mentor to Ali‘i Branco at Kamehameha Schools. Ho‘omaika‘i kela to Ali‘i Branco.